It's May! And there are lots of blooms here and elsewhere as we celebrate another Garden Bloggers Bloom Day. 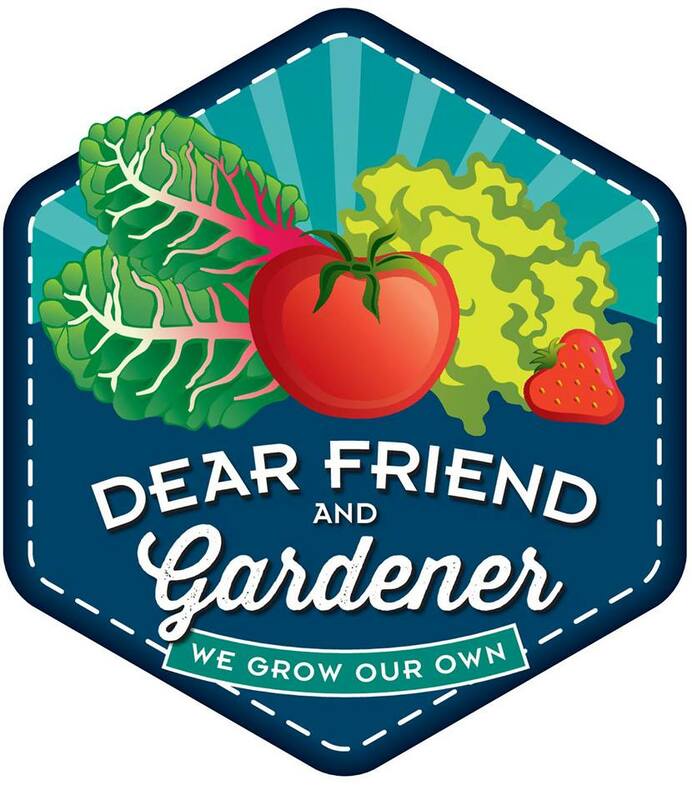 Carol at May Dreams Gardens invites gardeners around the world to share their blooms on the 15th of each month. I see I have lots of roses, interesting for a gardener who doesn't much do roses. Guess that's changed over the years! Rosa Flower Girl blooms almost all year..but this time of year the blooms are more abundant and darker pink. As the summer heats up the blooms will become almost white. Alstroemeria Regina is another long bloomer. The blooms are almost unreal looking...and make great cut flowers. Although one doesn't cut them, one pulls them from the plant so it comes off at the roots. It's easy and the traditional way to harvest for bouquets. The fountain bed has brunsfelsia (Yesterday, Today and Tomorrow), Rosa Berries and Cream, Solanum jasminoides, pelargoniums, and Alstroemeria Regina blooming right now. The German chamomile is ready for me to cut to dry for tea. Rosa Climbing New Dawn is happy in a somewhat shady corner. It's just about to climb into the adjacent privet which is fine with me! Salvia Caradonna blooms behind Salvia Blue Hills. Rosa Demitasse, a miniature rose blooms in the front door bed. Lavender trumpet vine is blooming on the trellis with a white banksia... the other banksia finished a couple of weeks ago so I appreciate this one holding on to join the trumpet vine. Rosa Berries and Cream blooms across the yard on a trellis mixed with Solanum jasminoides. Both will bloom all summer but like Flower Girl, this rose will become more white as the temperature rises. 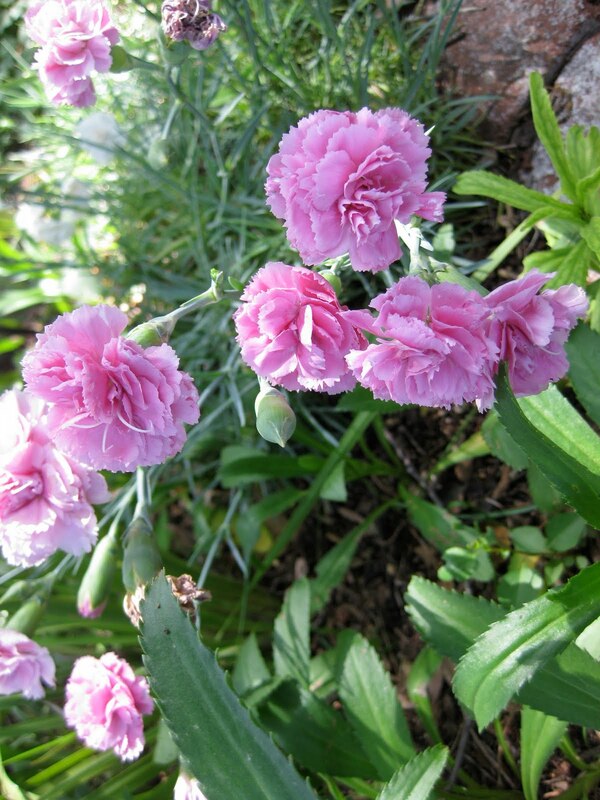 I love carnations! My dad gave us carnation corsages for Easter when we were young so the scent has good memories for me. These are in the front garden. I appreciate Carol getting us in the habit of doing this monthly list. There is so much to do this time of year in the garden that it's nice to stop and, literally and figuratively, smell the roses! Lovely blooms! I have never grown German Camomile. I looks so sweet in the photo. Your photos are gorgeous...love the one with the fountain. Ooh, you just reminded me to plant my German chamomile seeds for tea! Tomorrow and Tuesday will both be rainy, so that should work perfectly. But first, I think I need to drool a little more over your lavender trumpet vine. WOW, that's gorgeous! I always love seeing your garden entry for Bloom Day. Our gardens are very different and it's nice to see what's blooming in CA. Alstroemeria Regina is beautiful, I've never grown it. What a garden standout. I like the way the full planting around the fountain creates a secluded nook. The Alstroemeria Regina has wonderfully extravagant looking blooms. Isn't it a bonus when a good looking flower blooms for an extended period? Your roses all look good. I particularly like the shell pink colour of Flower Girl, and the bunches of multiple blooms. All your flowers are gourgeous! I enjoy your blog very much! 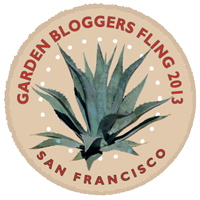 Just stumbled upon your blog...what a delightful garden you grow! Thank you for sharing it with us. Leslie, I am totally enamored of your climbers~Especially the Lavender Trumpet Vine. I don't know that one! Thanks Helen...the chamomile is quite easy to grow and I love it for the tea! I hope you got your chamomile planted Kim and that you got your hoped for rain. It's interesting to me too Patsy Bell...some things similar and a lot not! Every year I think the same thing about that alstroemeria Northern Shade...and on a plant that requires no care. What could be better! Thanks Jenn and Deacon's Wife...I'm glad you stopped by! Clytostoma callistegioides is the botanical name for the lavender trumpet vine Gail. It's another plant that, at least here, requires no care. Hmmm...seems as if that's the type of plant I do best with. Not sure what that means! Wow. Your garden is lovely! I picture Davis as being too hot for many of these plants, but you prove me wrong.